Calment held the record for longest lifespan, living until the ripest of old ages: one hundred and twenty-two years. She apparently met Vincent van Gogh once when he visited her father's store, and later described him as crass, dirty and badly dressed. 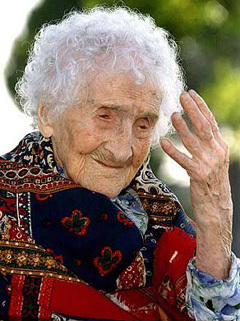 Calment stayed active even in her last years -- she rode a bicycle and lived on her own until she was 110.